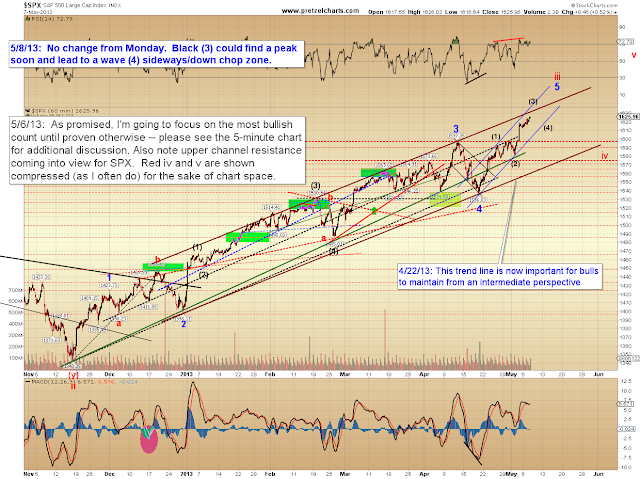 The S&P 500 (SPX) has continued to drift higher over the past couple sessions, as expected on Monday. Now that the market has broken out to decisive new highs, there's nothing in the way of horizontal resistance for the market to struggle with, there's simply channel resistance and Fibonacci zones. If bears can't reverse this fairly directly, then there's no reason to believe the market won't reach my longer-term targets from January (the mid-to-high 1600's -- and ultimately the mid-1700's). To be fair, I didn't anticipate we'd get there this directly; I thought we'd see more backing and filling first. This is a strange market environment, and if you haven't been trading for a long time, you may not realize exactly how strange it really is. 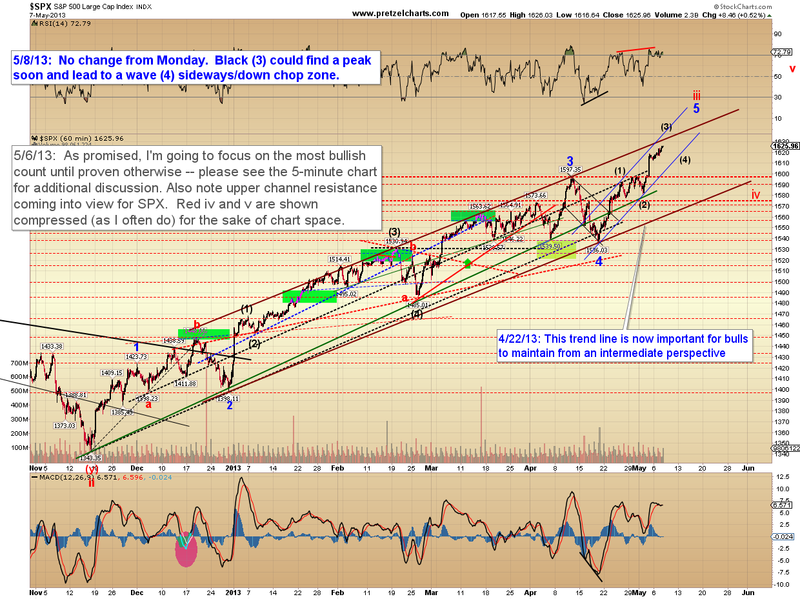 Due to the Fed's bubble pumping, the market technicals are now deeply detached from the economic fundamentals. And while the Fed points to things like the "good" jobs number last week as signs that they're doing something helpful for the fundamentals, the reality is that the growth rate in jobs has held steady at the same level it was before the QE-Infinity days. As I wrote when QE-Infinity was first announced, there's been no statistical link to the QE programs and job creation. Beyond that, the jobs we're actually creating in this economy are the types of jobs you might have thought were pretty cool back when you were 16 years old because of their "awesome" benefits, such as the benefit of being able to take home an unsold pizza from work, after a grueling night of delivering them. But if you're an adult these days, you may not be as excited as the Fed is about this "new job growth" -- especially if you have to feed a family, or a particularly large dog. But the government doesn't differentiate all that in the jobs numbers: There's no category for "Number of new jobs created which would still leave you eating a ton of Ramen Noodles." What I (and many other traders) find particularly flummoxing about this market is the fact that the Fed has managed to completely obfuscate the value of everything. What are equities actually "worth" these days? How about the dollar, or metals, or oil? With $85 billion of Nuevo Dinero being pumped into the markets out of the raw ether each month, how on earth can anyone have the faintest clue what anything is actually worth? It's an auction where the fat cats are playing with Monopoly money -- so the players who actually move this market don't need to be bothered with petty details like "value" anymore. Maybe that's what the Fed wanted all along. As long as this money flood goes on, without at least a larger crisis of confidence, bears are probably going to continue having a hard time getting anything to stick. Speaking of value, I haven't updated the US dollar chart in a long time. I was consistently bullish on the dollar from September 2011 until July of 2012, at which point I shifted to neutral with a slight bearish bias. That's where I remain today. Since July 2012, the dollar has spent those 10 months trading in a very large range. 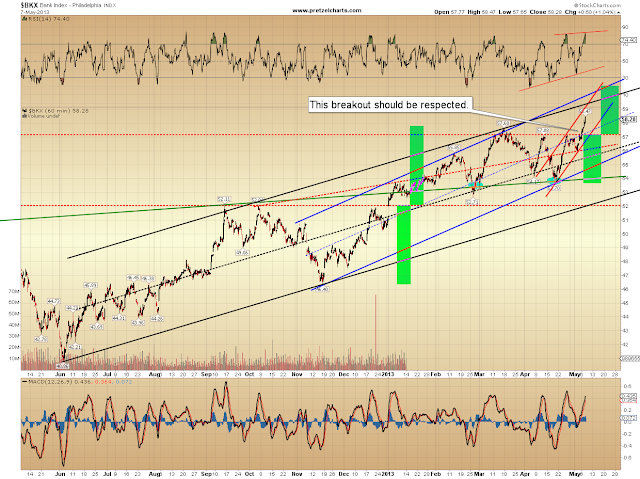 It's an interesting pattern now -- note the similarity of the moves highlighted by the red boxes. Last week I noted the Philadelphia Bank Index (BKX) might serve as a warning to bears, and it has now broken out to new highs. It's now approaching 58.83, the peak of 2010; this is the first time this market has challenged that high since. Unlike SPX, the BKX has not recovered anything approaching its nosebleed levels of 2007, when it traded at more than double its current price (the peak was 121.16). As a result, also unlike SPX, BXK does still have lots of horizontal resistance left to contend with, and will continue to be important to keep an eye on. In conclusion, unless the recent breakout whipsaws, there's really nothing in the charts for bears at the moment beyond random speculation. Trade safe. Are others having trouble logging onto DeepWave or just me? I don't know if it's only me, but when I try to access the "collegial Forum Community" URL, I only get the "Forbidden" page warning that I don't have access to /forums on the server. I didn't have problems getting to the forum yesterday -- or many other times. Anyone else having blog issues? I very much enjoy your analysis. And as a third party, I'm beginning to fully understand your biases (which are pretty much every conservative investor's biases). You're getting very close to understanding what's going on (imho). Think deeply about this post. Very deeply. What is the value of...anything? What do you measure it in? At a raw level, in trade. What's the value of a chicken? I'd say the NPV of all the eggs it produces over it's lifetime. How much are the eggs worth? Depends on whether you're about to die from starvation or not. How much is that worth in dollars? For a starving man, an infinite amount of dollars. For a non-starving man, depends on their options. Which one is "correct"? The value of the was dollar originally valued against a trade of gold and that value was created over thousands of years of trade. Since we went off the gold standard, the value of a dollar, is simply the value of the dollar. It's just a belief. Nothing more, nothing less. All the Fed is doing is keeping the value of the dollar constant against a basket of goods. And so long as people BELIEVE that the dollar will continue to act as a useful medium of exchange, we're in very little danger of what you believe will happen with your ongoing "top hunting." We as a society create this belief, and without a nuclear war or an asteroid hitting, I don't believe this belief is going to go away. Your analogy from the other day of the restaurant is (again imho) flawed due to this: the Fed is flooding cash, not credit into our society. So most balance sheets are going to remain whole..the Fed is actively separating our negative social mood and demographic demand decline (a la Harvey Dent) from balance sheet bankruptcies, and taking on all of that debt themselves. And so long as the value of the dollar stays relatively constant...I think we're going to be just fine. As a matter of fact, my long term Elliot Wave analysis from the Dark Ages suggests that we're done with this correction (so long as we get past Dow 16,000), and I think on to an almost Star Trek version of a moneyless society, because, coming full circle, you're right, What is the value of anything? Strange not being able to post there. I've been wanting to tell DRG all day that ANR was listening to both of us apparently and split the difference between our bottom calls. I've felt like an aimless soul today. That definitely says something special about the place you've set up PL. Bear markets exist to reset or pay for the sins of the previous Bull Market...I think what Pretzel is getting at is that there is in natural law and a cost for things...In time this Bull will end and the Bear behind it will reset to it's natural state... there will be a cost for this distortion of asset prices. The reason there is a distortion is that the economy is not naturally producing this amount of liquidity that is making asset prices go higher. 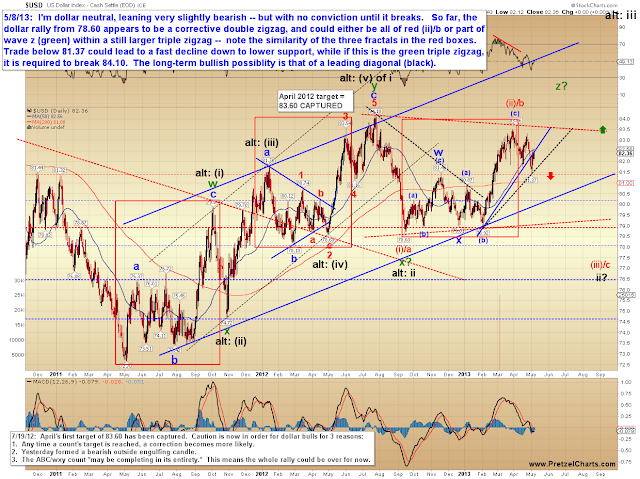 Currently the Fed is able to "get away" with what they are doing because the input costs of assets, i.e. 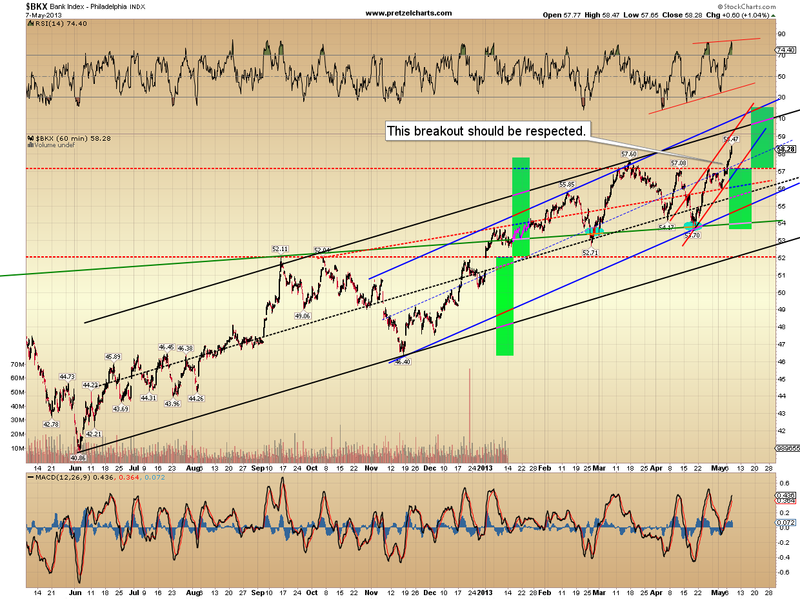 commodities have been in a downtrend. Once the excess liquidity finds it's way into that sector, then I am afraid the cost will be too much for the actual people, not the corporations with beautiful balance sheets (i.e. fuzzy math) in the economy to bear. Without wage growth to accompany the rise in all asset prices, and I mean all asset prices not just stocks, you will continue have a fundamental distortion that will cause very large problems to your Keynesian utopia that you envision. If there is any one chart that looks like it is about to set a fire to me it is the commodity sector (etf DBC)and there in lies a problem for the FED. I too see a very large Bull market however I do not have the ending utopian vision that you do. Will manage to the market I have, and currently we have a very strong market due to Central Bank liquidity. My long count is attached. I think your error message left the "fruit" off "Forbidden Fruit". Why go half-way when you can dance with a full costume? As for the danger of inflation...admittedly the Fed has a delicate balancing act, and they might just screw it up. But they might not. And while your chart does point to a major move, take a look at DJUBS, which goes back further providing for more context. What you're pointing out is a pretty massive triangle, and it looks almost identical to the DJIA during the great depression. Wave 3 following the Depression DJIA triangle was a relatively gentle, long upward slope. And if that happens with commodity prices, then again, the Fed is simply doing its job. Gotta love how "unlimited bandwidth" doesn't actually mean "unlimited." I guess it's not meant literally -- it's like hyperbole or something. Sorta like when someone says "This is taking FOREVER." and thank you to Rob520! I had it changed to a maintenance message -- otherwise people start thinking they got banned! Thanks for your thoughts, and I appreciate the well-reasoned discussion. I disagree with your fundamental philosophical argument, which I interpret as a variation on the idea that there is "no such thing as objective truth." I agree that man is a part of nature (in fact I have written such previously in the "about Elliott Wave" section) however being part of nature does not make man ABOVE the laws of nature. We can "advance" all we want, but we will still never be beyond the physical and natural order of things. IMO, where your "co-creator" theory is flawed is that the only thing we have evidence for is the idea that we can create WITHIN the natural framework -- we have been unable to create or alter that framework itself. So we are at the mercy of a fundamental natural order which we cannot change. And, in keeping with the discussion of natural law: the laws of thermodynamics state that neither matter nor energy can be created or destroyed. Therefore, per the fundamental laws of the universe, we cannot "create" money from thin air. We can only dilute some of the existing value of money into the "new money" (thus "redirecting and redistributing" the existing energy). This dilution of the dollar's energy essentially takes some of the value from each existing dollar and places it in the new dollars -- which makes the old dollars less valuable, and which will ultimately result in inflation. 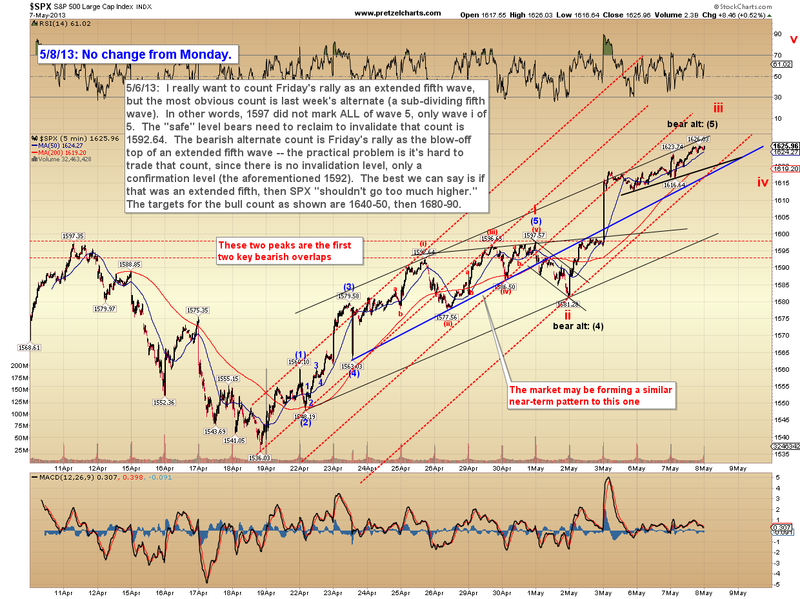 This drives up asset prices, and THAT is the main reason to be "bullish" on equities, IMO. As oneiron says, this is not a fundamental bull market, nor is it the dawning of the Age of Aquarius, which will lead us into a bright new "this time things will be different!" era. The moment the sun reaches its zenith, it begins to decline. After winter becomes coldest, the warmth begins to come. Everything in the universe is at some stage of constant flux, usually from one opposite extreme to the other. Times of abundance are followed by times of scarcity, and times of scarcity are followed by times of abundance. The fundamental laws of change guarantee that. This is not the first time in history such a financial scheme has been tried, nor will it be the last. The Fed has not finally, at long last, stumbled onto a "new secret system" which allows them to subvert the laws of nature and create money without producing anything. All previous such attempts have eventually led to disaster, and this one will be no different. But I do agree it can go on for a long time first, which is why I have been mainly (grudgingly) long-term bullish ever since QE-Infinity was announced. Yeah, sometimes I do because I think they might be real people with a genuine question or thought. Usually after the SECOND time, then I ignore them. Did you build this amazing site yourself? Please reply back as I'm looking to create my own personal website and would like to learn where you got this from or exactly what the theme is called. Appreciate it! Hello thеre! Do you know if they makе any pluginѕ to prοtect against haсkeгs? I'm kinda paranoid about losing everything I'vе worked harԁ on.